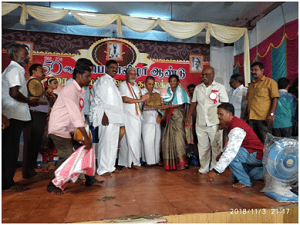 Kalaikavalar Kalaikuzhu , Karaikal during its 50th Anniversary on 03.11.2018 organized a programme to honor the excellent persons allover Puducherry and Karaikal in their respective fields. On this occasion Prof. Geetha.C, KGNC, received Kalvi Semmal Award for her excellence in field of teaching from Mr. Kamalakannan, Education Minister, Govt of Puducherry, in the presence of KAU. Asana MLA and Dr.Kesavan, IAS Dist. Collector at Karaikal Ammaiyar Mandapam, Karaikal.